Enjoy free shuttle service to all Walt Disney World® Theme and Water Parks. Kids can spend hours at Stormalong Bay water recreation area with all it's slides, lazy rivers, and fountains. Your family will love the pool, 230-foot water slide and lazy river at Stormalong Bay. Complimentary shuttle saves you the hassle of overpriced airport car rentals. One- and two-bedroom suites have jetted tubs ready to massage out any knots. Disney’s Beach Club Villas resembles a New-England seaside resort out of the early 1900s. It’s elegant and cozy at the same time with sweeping balconies, an ostentatious lobby mixed with intimate sitting rooms and charming American-style decor. The resort is home to a marina with pontoon boats available for rent, along with Stormalong Bay, a huge 3-acre water wonderland complete with water slides, a kids pool, 7 hot tubs, and 3 leisure pools. The resort offers daily kids activities at the Sandcastle Club. Cape May Café hosts a Disney Character breakfast and a seafood dinner feast. Huddle up at night for s'mores and songs by the campfire. Guests also have access to the amenities at Disney’s Yacht Club Resort. You’re a short walk to Epcot® and can take the boat to Disney's Hollywood Studios®. Studios include a kitchenette and one- and two-bedroom Villas feature a full-kitchen, living and dining areas, and in-unit washer/dryers. Guests must pre-book Disney's Magical Express, a complimentary transfer from the Orlando airport to the hotel. This service picks up and delivers luggage directly to guestrooms for those arriving between 5:00 AM - 10:00 PM. Guests must claim their own bags after hours. For more details and to book transfer service, contact the resort directly using the number provided on the booking confirmation email. Complimentary Resort Airline Check-In Service allows eligible guests flying on participating airlines and staying at select Walt Disney World Resort hotels to check luggage and receive boarding passes at the hotel. Guests flying on participating airlines and arriving through Disney's Magical Express are automatically enrolled in the service. Guests must call 407-284-1231 (5:00 AM - 11:00 PM) to pay luggage fees prior to check-in, or guests can check bags at the airport. For additional information, please contact the property using the number provided on the booking confirmation email. - Bus service from Disney Resort hotels begins 45 minutes prior to park opening and ends 1 hour prior to park closing. - Return service to Disney Resort hotels ends 2 hours after park closing. - Please ask a Cast Member to assist you in planning your trip from one park to another. The most direct route may involve a combination of bus, monorail or boat. 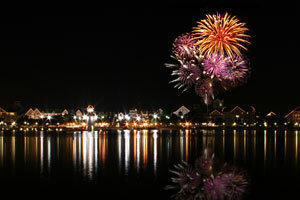 - Bus service from Disney Resort hotels begins 45 minutes before opening until 1:00 AM. - Return service to Disney Resort hotels ends at 2:00 AM. - One-way bus service from the 4 Disney theme parks operates daily from 4:00 PM until 11:00 PM or 2 hours after theme parks close, whichever is earlier.